I’m so excited to be sharing with you some more of our home decorated for fall! Their truly is a sense of “fall nesting” that takes over as cooler weather approaches. The need for wanting to create warm, cozy spaces to embrace you during the colder months ahead, is something I love to do for my family. Since we start to turn our focus on spending time indoors together, I love making sure our spaces are ready to accommodate all of our families needs. This means making sure cozy throw blankets are fully stocked and that there is one for everybody. I’m joining my friends from the bHome app in the final day of our Fall Home Tour Series. 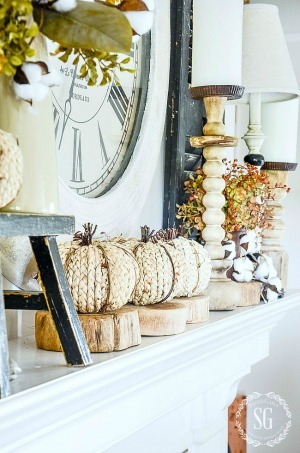 To start things off I love to sprinkle a few pumpkins on the bench in our entryway! 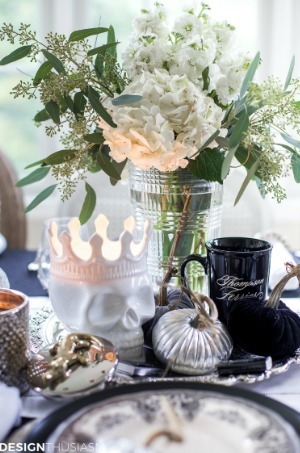 It’s the perfect way to greet my guests with fall right as the come into our house. It doesn’t take much. A few pumpkins here, a few pumpkins there, and instantly it feels like fall. In our kitchen I really keep things quite simple. I head outside and clip some branches from our yard and place them in my favorite white farmhouse pitcher on our island. I let nature do the talking when it comes to my decor. Just making a few simple switches, and of course adding some of my favorite fall scents in candles and soups do the trick! I shared some of my fall living room earlier this week. The first thing I do to help me get in the mood to decorate for fall is swap out my pillow covers. I replaced my summer blue toned pillow covers with cozy gray cable knit covers that remind me of sweater season just around the corner. I added in some deeper colors vs. the brighter hues I had for summer. When the colder months hit all I think about doing is curling up inside our warm home, and I wanted to create spaces that evoked that feeling. I love this little baby white pumpkins I found in my local grocery stores produce department. The fit perfectly in this wooden bowl, and add just the right touch of fall on my coffee table. 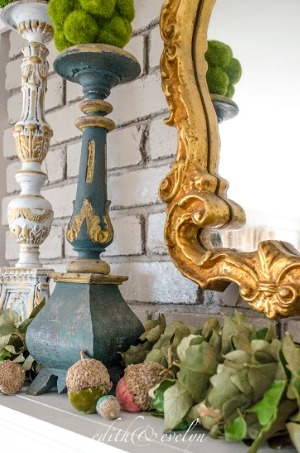 I also mixed in some faux pumpkins that are shades of deep greens and blues to emphasize the richer colors I wanted to bring out for fall. I had some left over clippings from my fall tablescape I did this year, and I loved the colors from that, so used small vases with the leftovers around my living room to carry in the same colors. I added more clippings and the same color scheme to the side table in our living room. Along with switching out the artwork in the frame to reflect more of the fall feeling throughout. More faux pumpkins finish off the details of my other side table, and I have to say this is one of my favorite fall decor color schemes yet! Even though I’ve used all of these faux pumpkins in years past, it’s fun to switch things up and use them in different spaces. I hope you’ve enjoyed seeing bits of fall around our home this year. Next up is the lovely Yvonne from StoneGable. She seriously is just the sweetest person, and you will love her farmhouse style! You can see who else is joining me today below. In case you missed any of the days of the tour, I have them all included below. I really love seeing all the different styles and what everyone has done in their homes this year for fall, and think you will as well! 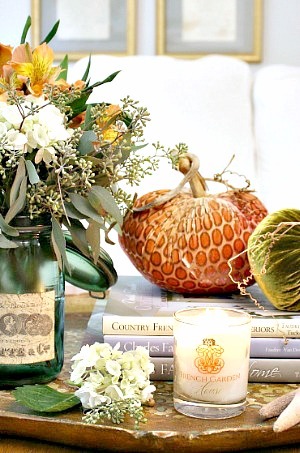 The colors in your Fall decor, i loved,it all looks lovely and cozy. Thanks for sharing. hey girl- love the tour! Y’all have a great weekend! Bre, I just love how warm and welcoming your home looks for fall. The color palette is lovely, just a deeper version of your usual style. The pale tones of your room keep it light and bright while the rich fall touched add seasonal warm. It’s quite beautiful! !